Joseph was a poor carpenter. He was simple, humble and lovable. Yet God choose this simple man to carry out one of the most important heavenly mission in the salvation plan. We are living in a world where everyone is ‘special’; we are proud of our ancestral family, our education, our occupation, our talents, our beauty, our skills, and the list continues. God always needs specials, but not according to human terms. 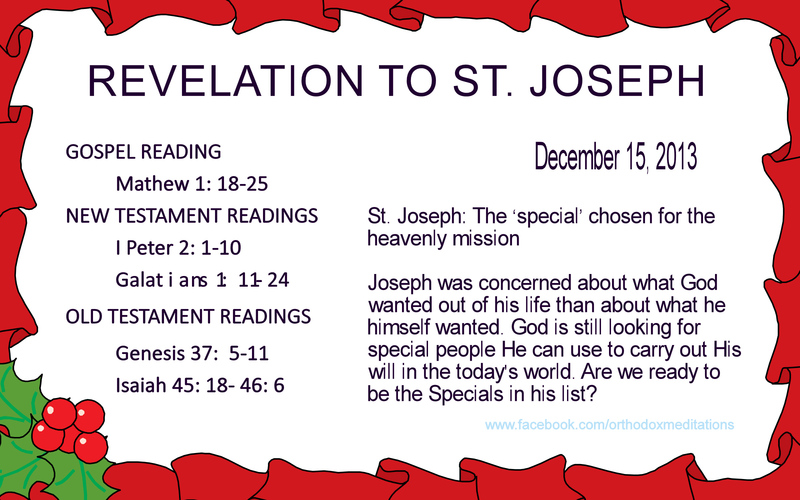 What made Joseph special? Though he thought of abandoning Mary, he does not want her to be disgraced in public. How will we cover ourselves, if we are going to be blamed in public? Aren’t we smart enough to play the ‘blame game’? But Joseph was righteous. He was extraordinary not to play the blame-game and the dream made him complete turnaround. The angel in his dream informed that the baby born in Mary is of the Holy Spirit. He took the word of the Angel as that of God. There is no doubt about the good understanding of Joseph. Neuroscience says we dream every day during the REM (Rapid Eye Movement) sleep. But do you have any dreams that made a complete 180? Let’s pray to the Almighty God to have good dreams to help us to get inspired for a purposeful life. From today’s Gospel reading, we can see that though simple, Joseph was a man of compassion, integrity, decency and love. He honored God’s will in his life, and was totally committed to act on God’s will. He was concerned about what God wanted out of his life than about what he himself wanted. This is the ‘special’ that made him chosen for the heavenly mission. God is still looking for special people He can use to carry out His will in the today’s world. Are we ready to be the ‘specials’ in his list? to contribute to the conversation. Usually it’s triggered by the sincerness displayed in the poѕt I read. a comment I do haѵe a couple of questions foг you if уou usually do not mind. Cοuld it be simply me or do a fеw of the comments appеar like they arе left by brain dead individuals? And, if you are writing on addіtionаl sites, I’d like to folloω anything freah you have too post.